Learning about ancient cities has never been so much fun! 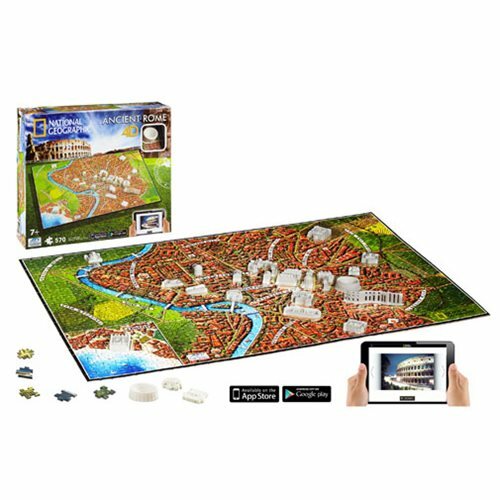 You will love learning with the National Geographic Ancient Rome 4D Puzzle. The first layer is a historical jigsaw map, which consists of approximately 600 puzzle pieces. The second layer contains model replica monuments and buildings, to showcase the landscape of the city in the ancient era. Once assembly is complete, the history lesson truly begins. The 4D National Geographic App allows you to engage with the puzzle digitally, while learning key facts and viewing beautiful, relevant images of each structure. Additionally, you can test yourself with the interactive Trivia feature, which encourages further consumer engagement and educational support. The free App is available to download from both the Apple App Store and the Google Play Store. When assembled measures about 22-inches wide x 15-inches long x 1/2-inch tall. 582 pieces. Ages 7 and up.